Home » Uncategorized » What is a Bosu and how is it used? What is a Bosu and how is it used? The Bosu is a relatively new piece of exercise equipment that is gaining popularity in fitness clubs and personal training studios. 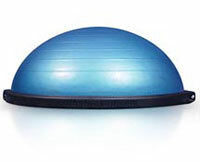 The Bosu resembles a fitness ball cut in half, with a flat rigid surface joined to an inflatable hemisphere. It takes it’s name from an acronym for “Both Sides Up” or “Both Sides Useful”, as both sides of the Bosu can be used in different applications. In general the degree of difficulty is increased when the inflatable side is against the ground, compared to the relatively easier use with the flat surface on the ground. As you might imagine from the above description, the Bosu provides an unstable surface for the purpose of engaging the core and supporting muscles during exercise to maintain balance. Perhaps even more significantly, the nervous system must respond quickly to the changing requirements of staying balanced on the Bosu. This can be of great value in the rehabilitation of injuries, and the Bosu is often recommended by chiropractors or physical therapists in the treatment of spinal injuries, to encourage n euromuscular facilitation. One of the main benefits of improved balance and increased speed of reaction to a loss of balance by the nervous system is in the prevention of falls. This is especially valuable with older adults. The Bosu often comes with one or more DVDs containing suggested workout programs. These can resemble step aerobics programs, and vary in content and intensity. They provide a good starting point for people new to exercise in general and Bosu training in particular. There is debate as to the benefit of the Bosu in resistance training programs. Aside from the obvious safety concern regarding the risk of a fall while lifting a heavy weight on a highly unstable surface, the concentration on the targeted muscle group is likely to be greatly reduced due to the effort required to stay balanced. Strictly speaking, in a hypertrophy / muscle building program it is better to just lift the heaviest amount of weight for the proscribed number of repetitions with good technique. For these reasons, the Bosu is best utilised only in the warm up or cool down portion of a weight training / resistance program.